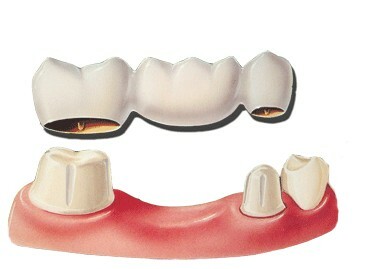 A bridge may be used to replace one or more missing teeth. A bridge is a prosthetic restoration that is cemented to a tooth on either side of the missing teeth. A bridge consists of false teeth (called pontics) and the anchors (abutment crowns) to support the false teeth. The entire structure spans the space vacated by the missing teeth. Neighboring tooth structure is removed and shaped to receive an anchor crown. An impression is then taken and sent to a dental lab where the bridge is designed. The structure part of the bridge is created with a strong metal alloy that can handle the anticipated stresses from normal wear and tear. Tooth-like porcelain is then fused to the structure. Once the bridge is tested for a correct fit, the anchor crowns are cemented in place.